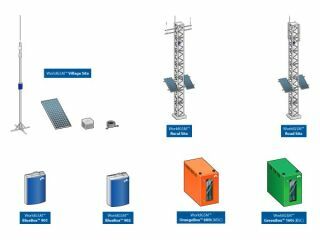 Swedish-Asian telecommunications vendor VNL has launched a solar powered GSM system it hopes will extend the customer base for mobile phone networks in rural areas. Rural areas in emerging nations, such as India or China, have been unable to own a mobile phone due to the lack of network coverage, as the towers required are expensive, power-hungry and there's a lack of skilled workers to install them. The WorldGSM station uses around five per cent of the usual amount of electricity, and is a complete GSM network in itself. VNL's new line is designed to run at a maximum of 120W of power, using less electricity, and is powered by the sun, so installation is relatively easy. They also use a 72 back-up battery to make sure the network remains stable. Indian firm Quippo Telecom Infrastructure will be testing the WorldGSM system in remote areas of India soon, and hopes to roll out the system to a number of locations, with a number of networks involved in talks. CEO Anil Raj says: "Telecoms operators and equipment manufacturers have traditionally failed to deliver GSM to rural areas for the simple reason that it's just too difficult and ultimately not sustainable. "There's no power, no engineers, no infrastructure, a difficult terrain, low density – and, most importantly, low subscriber revenues. VNL's equipment has overcome these challenges and provides operators with a truly viable way to connect the next billion mobile users."